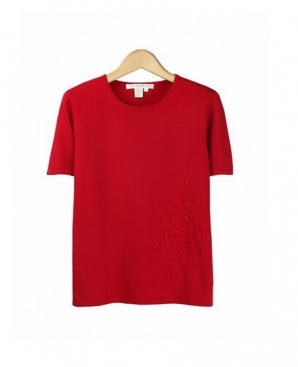 This silk cotton cashmere short sleeve jewel neck sweater has beautify hand embroidery design. 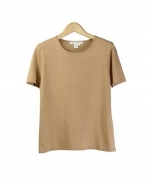 It is washable and has a soft touch and dressy look. Its' floral embroidered pattern, light weight, silky smooth touch provides comfort and a luxurious look. This short sleeve jewel neck sweater with embroidery matches the embroidered jewel neck cardigan as a set. Perfect for all occasions. 9 beautiful colors are available: Black, Camel, Chocolate, Gray Heather, Periwinkle, Pink, Powder Blue, Ruby, and White. Hand wash in cold water and lay flat to dry. Press with steam to bring back the original silky soft touch. Or dry clean.